On many “old home” sites in Oklahoma, where the first land runs were held, one can find old pear trees growing. Once Oklahomans established their roots in the state, the hardy, adaptable pear tree soon followed. Productive and long-lived, the old cultivars produced fruit that today would likely not be up to the quality standards of a commercial orchard or present day consumers. Today Oklahomans have many more choices of pears to grow. There are three main types of pears – European, Oriental Hybrid, and Asian. The most common is the European pear, Pyrus communis, which has the typical pear shape. These are smooth and sweet with colors ranging from green to yellow to red. European cultivars include ‘Bartlett,’ ‘Bosc,’ ‘D’Anjou,’ ‘Magness,’ ‘Moonglow,’ and many others. The second type is the Oriental hybrid. ‘Orient’ and ‘Kieffer’ are the two main cultivars, but many more exist. Oriental hybrids are usually considered more adaptable and more tolerant of fire blight than the European and Asian cultivars. Oriental hybrids often have more stone cells and the texture can feel “gritty.” They are used more frequently in processing than for fresh use, but some newer, improved cultivars have a smoother texture. Pears are grown very similarly to apples, but have two additional limiting factors to deal with – earlier bloom and greater susceptibility to fire blight. Fireblight is a devastating disease that appears in the spring affecting blooms, leaves, and twigs. The affected tissue turns black and dies and acts as a source of inoculum that can spread to other parts of the tree. Selecting resistant cultivars is the most effective means of control. Pears grow best in deep, well-drained soils with an optimum pH of 6.5. Pears, unlike peaches and many other stone fruits, can tolerate soils with high clay content; however, production and longevity is greater in soils that drain well and are not waterlogged. Other helpful site characteristics for pear production are elevation and air drainage. Spring freezes can eliminate crops in frost-prone areas. Planting the orchard on a high site with good air flow can decrease the probability of frost damage. Cold air will flow downhill until something impedes its course. Removing barriers such as overgrown fence rows and tree lines can lead the cold air to settle in the lowest areas, helping protect the sensitive blooms. Good air flow in the orchard also allows the leaves to dry quicker, reducing the humidity and disease incidence that thrives in wet conditions. European and Oriental hybrid pears are commonly budded to P. calleryana (of which ‘Bradford’ is a cultivar), and selections of ‘Old Home’ and ‘Farmingdale’ (OHxF) crosses. P. calleryana is drought tolerant and disease resistant. OHxF is highly resistant to fire blight and may control the tree size depending on the rootstock used. Asian pears are commonly grafted to P. betulifolia, a vigorous, well-anchored, drought-tolerant rootstock. Many pears require cross-pollination; therefore, another cultivar for pollination should be planted within 40 to 50 feet. Two complimentary cultivars should be selected to ensure good pear production. Pollen transfer is mainly conferred through bee contact. Because of their high tolerance to fire blight, Oriental hybrids are the easiest type to grow successfully. Many European and Asian pears are sensitive to fire blight, but susceptibility varies greatly with cultivar. Asian pears commonly set too many fruit and require blossom and fruit thinning for maximum quality and production. Another difference between the European and Asian pear is harvest time. Table 1 lists commonly grown pears and some of the qualities exhibited. Table 1. European, Oriental hybrid and Asian pear cultivar descriptions and quality characteristics. Plan your orchard well in advance. A soil test should be taken the year before planting and adjustments made to pH, phosphorous, and potassium, if necessary (see OSU Extension Fact Sheet HLA-6232, Fertilizing Pecan and Fruit Trees). The amendments used to adjust these deficiencies are slow to move through the soil. Eliminating perennial weeds such as bermudagrass or Johnsongrass the year before planting is much easier than after trees are in the ground. Spraying with glyphosate and then planting with a hybrid sudangrass will help with weed control and build up organic matter. Find a reputable nursery with the combination of cultivar and rootstock you desire, and order early to ensure availability and delivery date. A small tree will have less transplanting stress and will cost less than a large tree. Pears should be planted in the fall or early spring while the trees are dormant. When the trees arrive, inspect the shipment carefully for damage and moisture. Protect the root system from freezing and drying until they are planted in the ground. Trees may be healed in for a short period prior to planting if necessary. Soaking the root system overnight before planting is beneficial. Pear trees can grow to be quite large and should have at least 16 feet or more between trees in each row, and 25 feet between rows. Dig holes large enough to accommodate the root system. Plant the tree at the same depth that the tree grew in the nursery. Backfill the hole with soil and tamp it down to eliminate any air pockets. Water the tree to settle the soil. Do not put any fertilizers in the hole. Nitrogen fertilizers can be applied after budbreak. Pears can be pruned in three basic forms: central leader, modified central leader, and open center (also see OSU Extension Fact Sheet HLA-6228, Annual Pruning of Fruit Trees). Central leader trees have one main trunk with about a dozen or more scaffold branches deriving from the trunk. The top of the tree is narrower than the bottom and often takes a cone shape. The modified central leader also has a main trunk but only five to seven scaffolds originating from the trunk about 6 feet off the ground. It is usually an oval shaped tree. The open center pruned tree has one trunk with three to five major branches about 3 feet from the ground. This style has very few branches in the center and takes the shape of a vase. Many growers choose to prune their pear trees to the modified central leader or open center. If the tree contracts fire blight, the entire tree may not be lost. Only scaffolds affected need to be removed, leaving a partial tree. The central leader tree may produce fruit earlier than a multiple leader pruned tree. Asian pears have different growth habits than European pears. The Asian pear tree will have very upright growth with extremely narrow crotch angles. The narrow crotch angles are weak and prone to splitting. 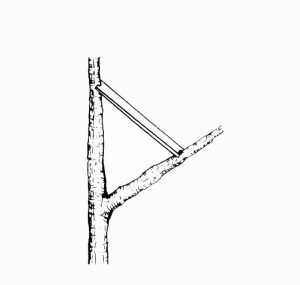 Trying to change these angles is fairly difficult and trees should be allowed to grow naturally or with training to a modified central leader (Figure 1 to 4). The newly planted tree should be pruned to a height of 36 inches to balance the above ground portion with the reduced root system. 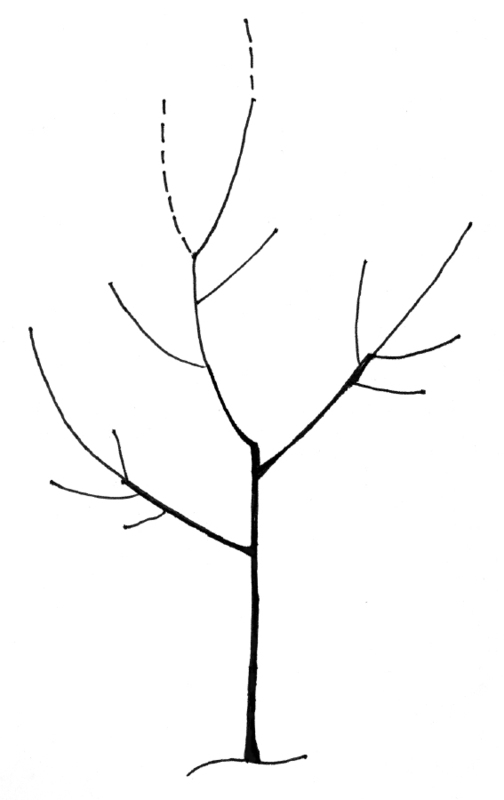 Also, cutting off the top of the tree forces buds to push and provides branches to select for scaffolds when establishing structure the following season (Figure 1). Remove any branches lower than 30 inches above the ground. 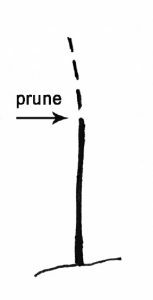 If any branches exceed 30 inches and have wide angled crotches, prune back to 20 inches. 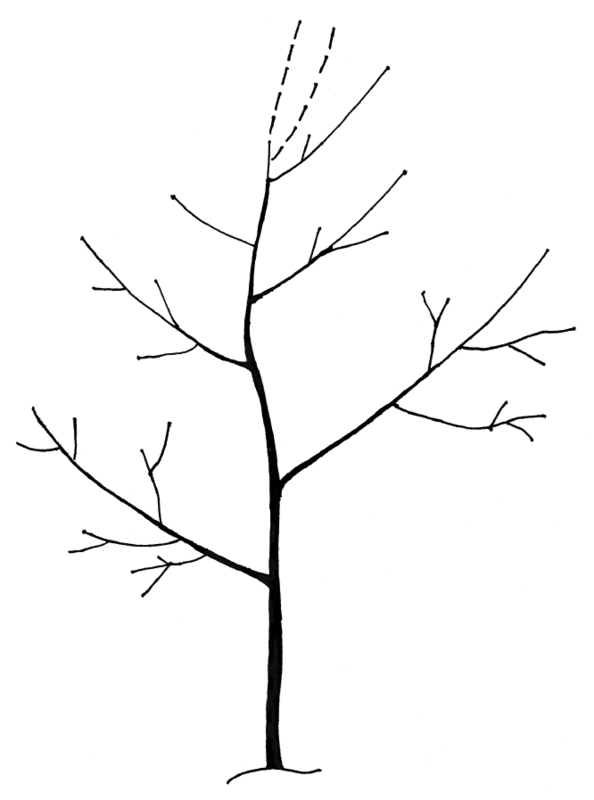 After the first growing season, the trees should be pruned in late winter (Figure 2). Retain two to four upright shoots that developed below the first heading cut. The longest, straightest shoot will become the leader. Cut back one-third of the leader and remove any competing shoots. Remove all shoots on the trunk lower than two feet and retain two to four wide angled shoots. Prune the top one-third of these remaining shoots. Figure 2. Modified Central Leader, Year 1. In the second year, the straightest shoot that develops from the leader should be kept and all competing shoots removed (Figure 3). The most horizontal shoot below each heading cut from the previous year should be retained and the other vigorous shoots removed. Eliminate low branches and upright competing shoots. Shorten the leader and the other shoots about one-third. 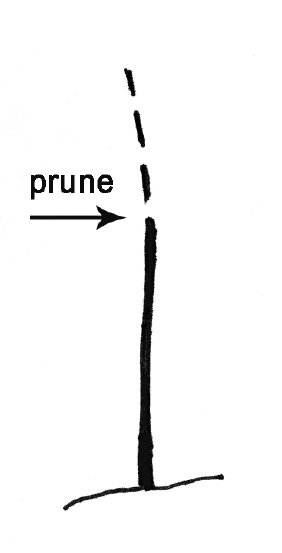 When fruiting begins, usually in the third year, the weight of the fruit will pull the branches down, giving the tree a more drooping appearance (Figure 4). Fruiting also slows the vigor and trees will need less pruning. Removing the most vigorous upright growth and shortening the more horizontal growth each winter will take care of most pruning needs. Asian pears usually are about 8 to12 feet tall when fully mature. Figure 3. Modified Central Leader, Year 2. Figure 4. Modified Central Leader, Year 3. European pears mature earlier when trained to a central leader system, but can also be pruned to the modified central leader as described above. The central leader style has one main trunk with many scaffolds arising from the trunk. 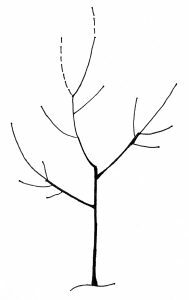 Similar to the modified central leader system, the newly planted tree should be pruned at 36 inches above the ground (Fig. 6). Remove any branches below 30 inches as well as broken or narrow crotch angle branches. After the first growing season, select the most upright and vigorous shoot that developed below the first heading cut to become the central leader (Figure 7). Shoots with narrow crotch angles should be removed and limbs that at least 28 inches from the ground with more ideal angles should be kept. 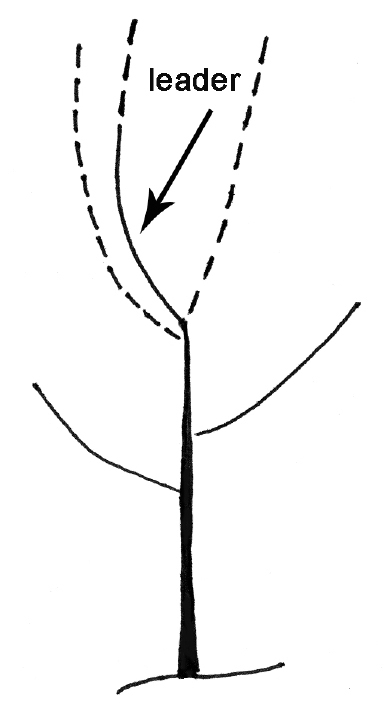 Limb spreaders can be used to re-orient branches with less desirable crotch angles to about 30 to 40 degrees (Figure 5). Spreaders can be purchased or made from wood with sharp nails in each end. One nail is placed in the trunk and the limb is spread to the desired angle and then secured with the other nail. After several months, the spreader can be removed and the wound will heal quickly. 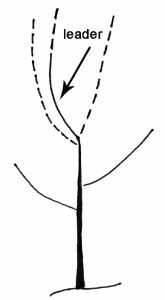 Each winter, the central leader should be cut back about one-third and any competing branches or narrow crotch angle branches removed (Figure 8). Retain branches with wide angles. In the modified central leader system only the leader is headed back each year. After fruiting for a couple of years, some branches should be removed. 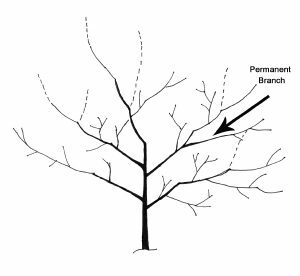 Permanent branches should be about 3 to 5 feet from the ground, circling the trunk like a spiral staircase (Figure 9). 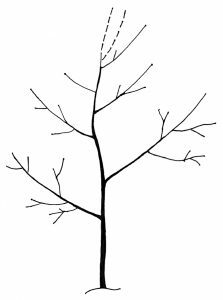 Each branch should be spaced about 4 to 6 inches from each other. 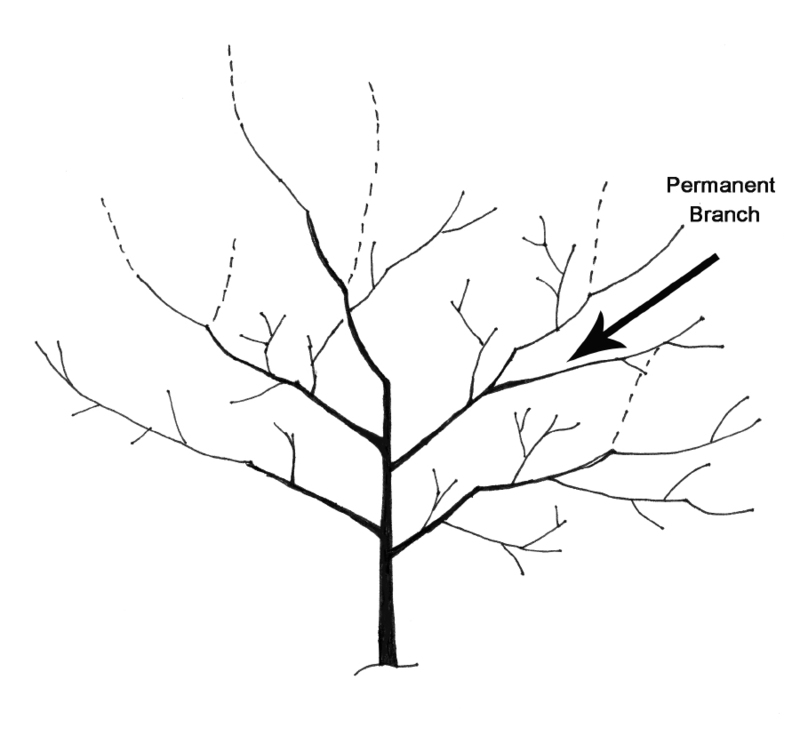 Eight to 12 temporary limbs should be left above the permanent branches and later removed when the limb grows to about one-half the diameter of the trunk. New shoots will grow and act as replacements where older limbs have been removed. This continuous limb removal will keep the tree top narrow and less vigorous. Rootstock suckers at the base of the tree should be removed as soon as they are seen in the spring. These suckers are often thorny, and if left unchecked, can become a significant problem. A mature pear tree will be about 16 to 24 feet tall. Figure 5. Limb spreaders can be used to improve narrow crotch angles. Figure 7. Central Leader, Year 1. Figure 8. Central Leader, Year 2. Figure 9. Central Leader, Year 3. Because vigorous growth is more susceptible to fire blight, fertilizer should be applied only in limited amounts. The pre-plant soil test should indicate if deficiencies of phosphorus, potassium, and pH problems exist and should be remedied before the trees are in place. If cultivars are susceptible to fire blight, little or no fertilizer should be applied. After growth begins for first year trees, ½ cup of 13-13-13 should be spread in a circle about 6 inches away from the trunk. For the first four seasons, increase the amount by ½ cup each year and then continue with about two cups each year thereafter. Although pears are drought tolerant, growth and fruiting will be enhanced with additional irrigation. Especially in the establishment phase, watering once a week will aid in tree growth and survival. Water the trees adequately to wet the soil several inches deep. A slowly applied drip irrigation or soaker hose emitting approximately one gallon per hour for five to eight hours a week will be sufficient for most young trees. Weeds compete for moisture and nutrients and can limit the pear tree’s growth, especially in the establishment years. A weed free area at least 3 feet from the trunk can be maintained by pre- and post-emergent herbicides or by using mulches. When using systemic herbicides (e.g. glyphosate), use caution to keep any spray or drift off of green tissue. Always read labels of any chemicals used to have knowledge of proper application and safety. Mulches provide both weed and moisture control. Fabric or organic mulches such as bark or wood chips allow water penetration and suppress weed growth. Healthy pears require crop load thinning each season. Results of over cropping include poor fruit size, reduced quality, reduced fruit set the following season, alternate bearing, and perhaps broken limbs. Crop load thinning should begin during bloom and continue for three to four weeks for the most benefit. European pears usually have up to five blooms per cluster and should be reduced to one fruit per cluster. Asian pears commonly have up to a dozen blooms per cluster and have the most potential for over bearing. Reduce clusters to one or two blossoms per cluster and thin clusters to one every 6 inches. Marginal results have been achieved when chemical thinners have been used on pear. Although chemical thinners are available for European pears, they must be used properly to achieve desired results. Thinners such as naphthaleneacetic acid (NAA) and naphthylacetamide (NAD) are applied at specific bloom stages and fruit development. However, even with the use of chemical thinners additional hand thinning will be required. Asian pears do not respond to chemical thinning, thus hand thinning is the only option. Asian pears are harvested when the skin color changes from green to greenish yellow or when taste determines ripeness. Asian pears should be allowed to tree ripen. When the skin and flesh are juicy and sweet, they are ready to be harvested. At room temperature, Asian pears will maintain quality for a week or more, but if held at 32oF, they may be stored for 3 to 5 months. Determining harvest dates for European pears is difficult and many things should be considered. European pears ripen from the inside out; therefore, if the outside is ready to eat, the inside will be mushy and over-ripe. They must be harvested and allowed to ripen off the tree to develop properly. Several factors must be combined to determine harvest time, including: flesh firmness, soluble solids (sugars), starch development, color changes, ease of picking, and days from bloom to harvest. European and Oriental hybrids are picked and ripened off the tree. Flavor and texture can be affected adversely if fruit is not harvested when the fruit changes firmness and color. Unlike other fruits, European and Oriental hybrid pears require a period of chilling to ripen properly. Unless this chilling requirement is met, most pears will not ripen, but rather shrivel and rot. This chilling time is cultivar dependent and can range from two days to two weeks. After chilling, pears should be ripened in 65 to 75 F temperatures with high humidity to develop full flavors. When the flesh below the stem is slightly soft, the pear is ripe and ready to eat. Because the pear is a climacteric fruit (continues to ripen after harvest), the primary intention is to slow down the rate of respiration and keep the tissue living longer. To achieve this, the fruit should be cooled quickly after harvest and stored at 30 F. If this temperature is not possible, ~35 F in a household refrigerator will extend the life for several months. Storage life depends on cultivar, but fruit of some cultivars will last from three to eight months. Pears can be grown with little need of fungicides or insecticides. The main pest of pear is the bacteria that can cause fire blight infections. Some ways to eliminate the risk of fire blight are to choose resistant cultivars, avoid vigorous growth by limiting nitrogen and severe pruning, use copper fungicides before bud swell, apply antibiotics every five to seven days during bloom and after hailstorms, and remove fire blight infections early. Cutting 6 to 8 inches below infected areas and disinfecting pruners between cuts with a 10 percent liquid bleach solution will slow the spread of the bacteria.